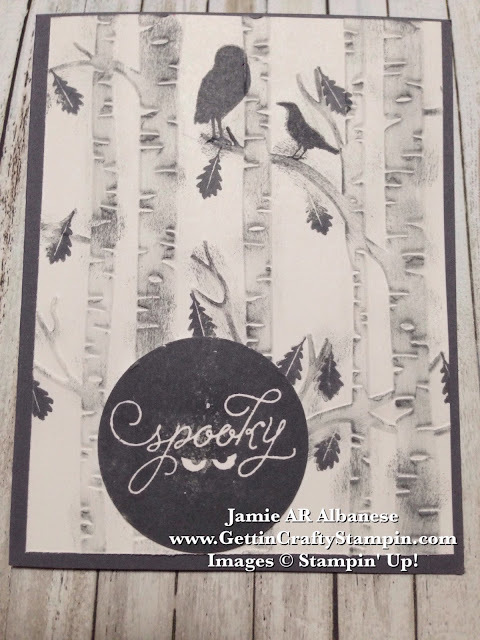 It is spooky how cute this hand-stamped card is! Perfect for Halloween, this bundle combines to give you a great Woodland Embossing Folder and this Among the Branches stamp set to cover your Fall through Winter card making and paper crafting! 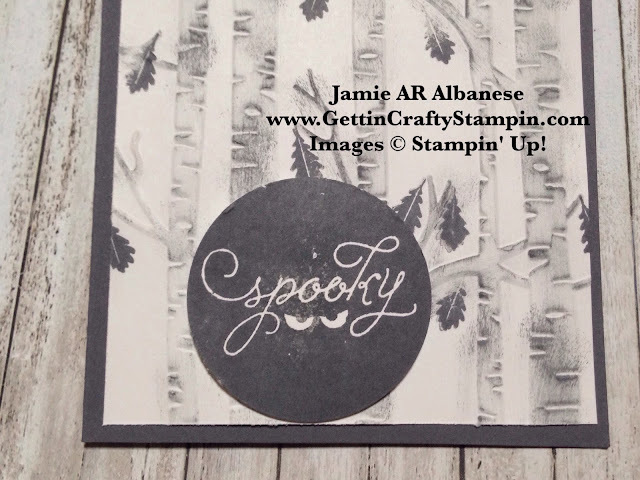 Join me in sending a spooky hand-stamped card to deliver smiles this year. I adore this new Woodland Embossing Folder!! Bundled (saving me 15%) with this great Among the Branches stamp set you can score a great savings and combo!! Embossing this Whisper White card stock using this folder and the Big Shot you attain a great textured background! 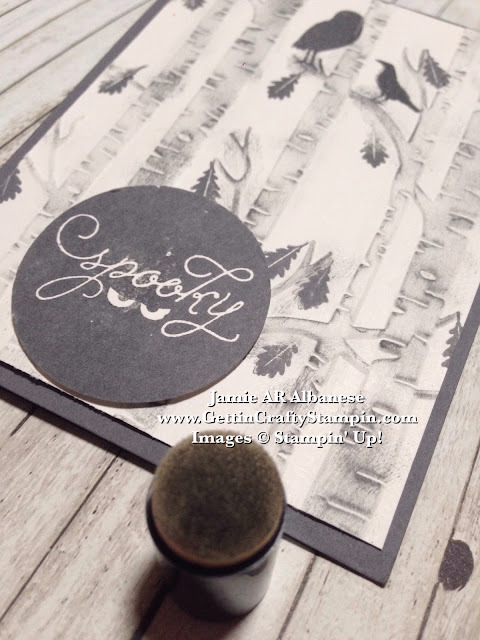 Add depth and color using our Sponge Daubers in the new Basic Grey Archival ink pad and create a 'spooky' looking background. Stamping these leaves and the birds adds to the mystery. Photo-polymer allows to stamp right where you want as you can see right through it! *****JOIN US at the Quartlery Gettin' Crafty Stampin' Holiday Card Making Wonderland on Sept 26th... we will be Raffling OFF the Big Shot Die-Cutting Machine (and over $500 in items on that day alone!!) ***** Ask ME how YOU can get the Big Shot Die-Cutting Machine for FREE or 1/2 OFF!! With a full collection from the one of the best catalogs in ages - you can be the first to enjoy the awesomeness and score the FREE Items when you book a Private Class with me! Score the BEST Deal of $125 for only $99 and FREE Shipping when you take the starter kit home - a kit YOU Pick!! This cute circle saying pops out when you punch it with the 2" Circle Punch (easy peasy!!). Stamp Photopolymer over a Stampin' Pierce Pad to give a better stamped image. I am loving the quality of our new Archival ink pads.. so easy to use and true to color! It's spookly easy how fun it is to create this seasonally perfect Halloween card! Giving a card, just-because, for the season, etc. is a great way to deliver smiles. I am not a big Halloween girl but I do love how cute this hand-stamped card came out. Join Us in creating and sending love... wrapped up in a hand-crafted card at our card making classes (in-person or to-go options available).